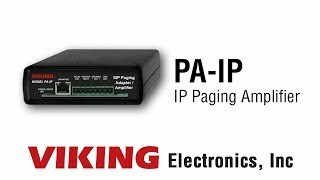 The Viking model PA-IP SIP / Multicast Paging Adapter provides an interface between new VoIP phone systems (hardware or hosted / cloud based) and analog paging systems, eliminating the need for an ATA or FXS port. 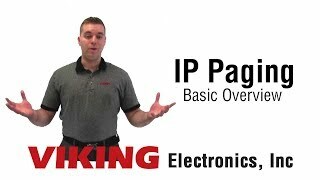 The PA-IP can be used for standard SIP endpoint paging or multicast paging and background music. The unit easily connects with a single CAT5/6 cable from your PoE switch. An auxiliary trigger input allows an optional hard wired switch or phone system trigger output to enable loud ringing / night bell from after hour incoming calls. Line-level audio output connections are provided for connecting to an external amplifier. A built-in 6 Watt class D amplifier with speaker output connections is also provided to drive up to 6 analog 8 Ohm speakers. A programmable relay output is provided for triggering external amplifiers, etc.